If you ride an older bike it's obvious that certain things are going to wear out and/or there may be new innovations out there from various aftermarket companies that have found ways to improve on an older design. This time it's time for a number of new things. Some worn out, some to help improve performace, and some for both reasons. Here's what went onto the bike today. 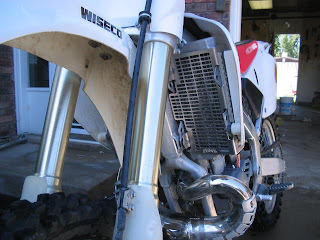 Ultra Heavy Duty tube, shift lever, Boyesen water Devol radiator guards, an in line water cooler, and a Dunlop D952 rear tire. The difference between the old tire and the new one was unbelievable. I guess the old one was really worn out. The new Dunlop tire is a race tire design with harder rubber compounds for a longer life and better durability on hard terrain. The ultra duty tube seemed like it was about an eighth inch thick! They weren't kidding when they said Ultra heavy duty! 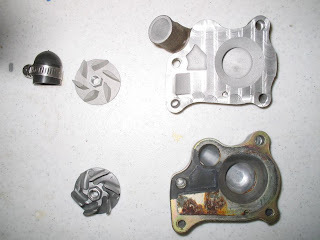 Here are a couple of shots of the new water pump cover and impeller compared to the old stock unit. You can see the difference in vane design as well as the obvious difference in the path the water path creating a more laminar flow as opposed to a turbulent flow. 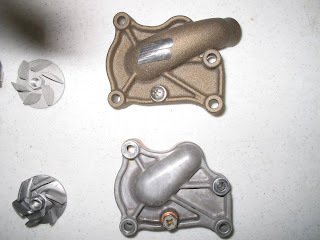 All of this is said to increase flow and improve the cooling of the bike and reduce cavitation or the tendency to produce bubbles in the water which also hampers the flow. 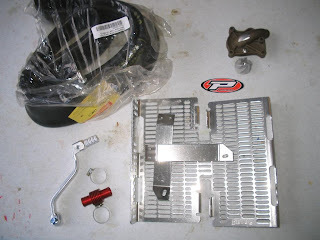 Hopefully the addition of the Boyesen water pump, in line cooler, and the radiator guards will keep the bike running cooler in more situations. Even though it never overheated, I would notice a power loss and more of a tendency for the bike to stall at the end of long climbs. A new radiator cap is on the way as well to insure a proper seal since the old one seemed to puke to soon, and not hold enough pressure. The hardest part of all of this was un-mounting the old and re-mounting the new tire. It takes a lot of strength and patience to muscle the tires. The guards would have been an easy install if the radiators were not slightly bent. I had to put a puller on them to pull them out before I could get them to fit on. UPDATE- I took the bike out last weekend and the bike is perfect! All the upgrades really made this bike more rideable. 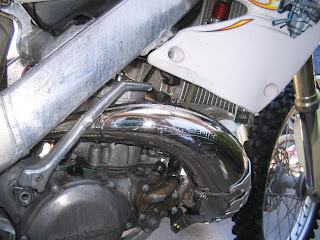 It had nice grunt down low, but still had all the 2-stroke zip I could want. It never overheated or lost power and it really ripped up the hills in the higher revs. I already rounded the leading edges of the tire, but it held up pretty good considering all that I put it through. I think I might miss the instant hit off the bottom in the dunes, but overall the bike is %110 percent better than when I purchased it 5 months ago. 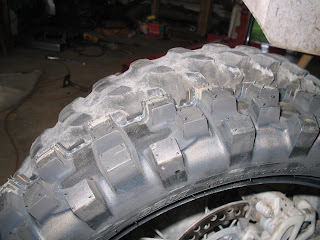 The dunlop tire has had a lot of grip, but I prefer the maxis desert terrain for desert traction and durability.